; 3/$6 Nabisco Snack or Ritz Crackers, Toasted or Popped Chips or Chips Ahoy! Cookies; $5.99 Live Chicken Lobsters; $3.88 Sweet Whole Seedless Watermelon; $4.99 Tide Liquid Laundry Detergent; 5/$5 Bumble Bee Solid White Tuna; 5/$5 Frozen Vegetables; 10/$10 Chobani Greek Yogurt or Flip; $8.99 Wild Caught Yellowfin Tuna or Swordfish Steak; $8.99 Boar’s Head Black Forest Ham and Mild Swiss Combo; $4.99 Chicken Tenders or Wings; 2/$5 Tribe Hummus; 3/$10 Cascadian Farm Cereal; 2/$5 Nature’s Promise Tortilla Chips; $.99 Nature’s Promise Organic Carrots; $1 off Dr. Bronner’s Natural Soap Products; 2/$5 Late July Tortilla Chips; $1.99 Ball Park Meat Franks or Oscar Mayer Meat Franks or Hardwood Smoked Turkey Franks; $4.99 Johnsonville Italian Dinner Sausage Links; $2.99 Fresh Boneless Country Style Pork Ribs; $1.29 Fresh Split Chicken Half Grillers or Whole Chicken; 2/$5 Kraft Deluxe Macaroni & Cheese; 4/$5 Near East Rice Pilaf or Couscous; 2/$5 Pillsbury Grands! Biscuits; $1.49 Friendship Sour Cream; 2/$4 Kraft Philadelphia Cream Cheese; $5.99 Clorox 2 Liquid Bleach; 2/$7 Lysol Disinfecting Wipes; $8.49 Glad Kitchen Bags; $5.59 Stop & Shop Paper Towels; $1.99 Dixie Plates, Bowls, Cups or Napkins; 2/$5 LU Cookies; 2/$6 MiO or Crystal Light Liquid Water Enhancer; 2/$3 Pearls Black Ripe Olives; $12.99 Milo’s Kitchen Dog Treats; $3.99 Banquet Chicken; B2G1 GE Light Bulbs; 2/$3 Smart Living Ceramic Dinnerware; $7.99 Secret or Gillette Clinical Strength Deodorant; and more. 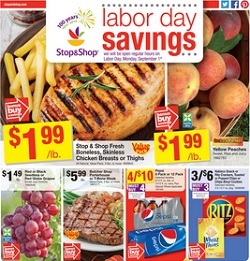 To see the weekly circular for your favorite Stop & Shop store, search by ZIP Code or City, State. Check back often for new coupons, circulars and weekly ads.